Everyone looking to build a business is always on the prowl for new customers and more new businesses. I’m amazed at the number of people who don’t have a prospect list of potential customers who you can phone, email, pop in and meet or find a way of approaching to help guarantee them success in their business. 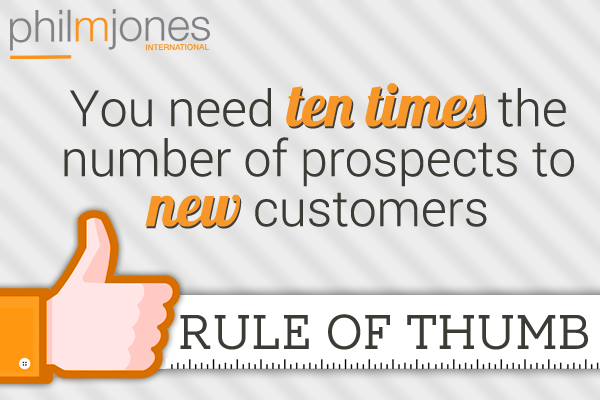 As a general rule you need ten times the number of prospects to new customers, so if you want to add ten new customers this year you need a hundred people on your list, who fit your target market, who you can invite to take the next step on your product or service. If your list is lower than that number level you need to find more prospects for your list. Consider who you could do business with? 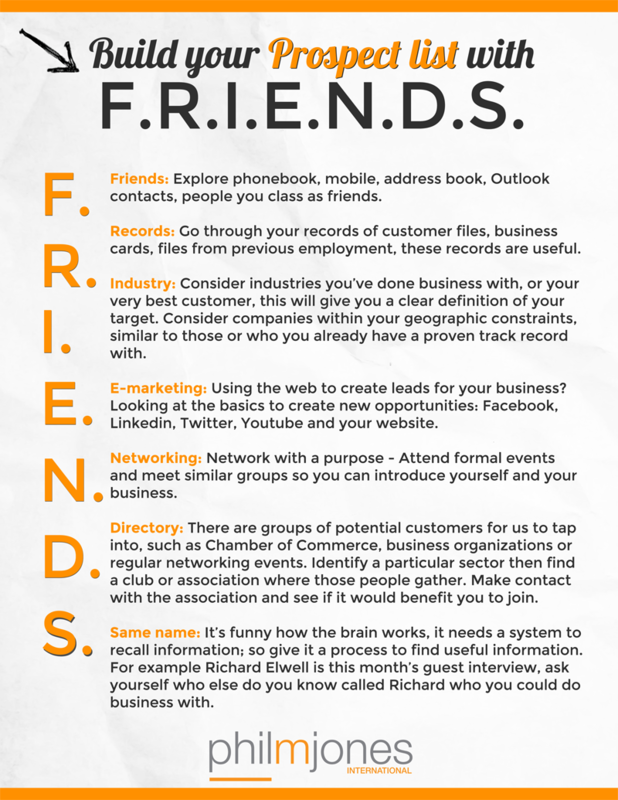 Start with friends and, how they might be able help, or perhaps you can do business with them. Making cold calls is not something we relish, so by taking time to identify your ideal customers first, then decide on a genuine reason to contact them, other than doing business, those cold calls suddenly became warmer! F – Friends: Explore phonebook, mobile, address book, Outlook contacts, people you class as friends. Consider if any fit or could lead you to someone who fits your target market? If so, add their name to your list. R – Records: We all keep records; customer files, business cards, files from previous employment, these records are useful. Go through them, check if any fit your target market or could lead to somebody who could, and add their name to your list. I – Industry: Consider industries you’ve done business with, or your very best customer, this will give you a clear definition of your target. Consider companies within your geographic constraints, similar to those or who you already have a proven track record with. Consider industries you would like to do business with and those company names, and names of individuals within those companies, add to your list. •Facebook profile – look at your friends? •LinkedIn connections – could any of these be people you could do business with? •Twitter followers – might some of these be able to do business with you? •YouTube channel subscribers – could any be potential customers? •Website – is yours generating leads and enquiries for your business? Is it adding names to your list? Ensure your website is performing as the second best sales person in your business, providing you with names and phone numbers of potential customers. Consider website users as window shoppers with a genuine interest in your product or service, but who have not picked up the phone or made an enquiry. A strong ‘call to action’ is needed to create an exchange of email addresses for something of value. N – Networking: Network with a purpose – Attend formal events and meet similar groups so you can introduce yourself and your business. Network in rooms full of strangers, who you could potentially do business with. D – Directory: There are groups of potential customers for us to tap into, such as Chamber of Commerce, business organizations or regular networking events. Identify a particular sector then find a club or association where those people gather. A simple Google search could lead you to an ideal membership directory to get access to those people. Make contact with the association and see if it would benefit you to join. S – Same name: It’s funny how the brain works, it needs a system to recall information; so give it a process to find useful information. For example Richard Elwell is this month’s guest interview, ask yourself who else do you know called Richard who you could do business with. Then ask yourself about Elwell. Skim your list and in doing this exercise you’re likely to add another 10, 15, 20% of names to the list. Use that system regularly and you’ll soon have a stream of quality prospects that fit your target market, who you can pick up the phone to, email and arrange meetings or start making contact with, find out if you can do business together. Always continue building your prospect list and remember you want ten times the number of prospect names to the number of new customers, to set yourself up to succeed. I found your blog on google and read a few of your other posts. I just added you to my Google News Reader. Keep up the good work. Look farrowd to reading more from you in the future.